I have completely rewritten the software for the VFO. I was not satisfied about the working of the encoders and the accuracy of the VFO and the calibration option as well. – Removed the calibration option, it was not good working over the entire frequency range. I’s better using an external reference such as a OCXO or GPS frequency standard. Important notice: After updating the software you have to modify the hardware as well! The connections of the encoders and encoder-switch has been changed, see the schematic! Friends of mine where searching the Internet for a Tracking Generator (used i.c.w. 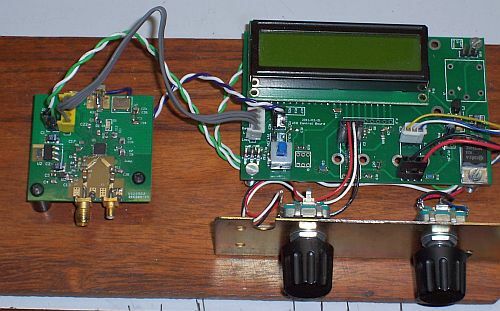 a Spectrum Analyzer). They found the website of Yanjun, BG6KHC who has built one (and also a spectrum analyzer based on the design of Scotty Sprowls, see my Spectrum Analyzer project pages). 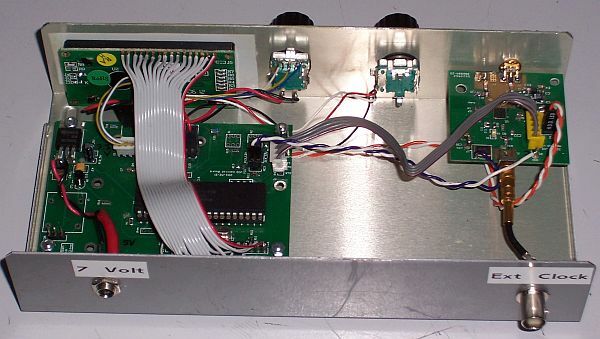 This generator was based on the Analog Devices ADF4350, a Wide band Synthesizer. The frequency range of this chip is from 137 to 4400 MHz! There is also a ADF4351 which has an even greater range: 35 to 4400 MHz. Both chips are pin compatible. So I decided to use the ADF4351 chip to design a VFO and see how it works. Before I could start I asked Yanjun if he was selling his PCB’s and he did. After a week or two, the boards arrived and I start building the VFO and the PIC (18F452) control PCB to control the ADF4351. In addition to that: SV1AFN is also selling a nice ADF4351 board. Because the PIC board of Yanjun was in a experimental stadium, I had to made some modifications to it, e.g. the PIC working now on 3.3V in stead of 5V because the ADF4351 is running at 3.3Volt as well. For that reason I added a 3.3V regulator on the board. Also Yanjun has added the 3.3V regulator on his newly designed board. I also modified the software to get a VFO with a lot of extra (menu controlled) features. After pressing the menu button again you will be returned to the last used frequency and settings. A special note about the used encoders: There are different types of (cheap) encoders. The C (ground) connection is sometimes in the middle or at the left side of the 3 connections, looking at the top of the connections. When you connect the encoder wrong, it’s not working (well). See the note on the schematic. Because I missed the information about the actual output power of the VFO (set with the Menu function), I added the selected output power on the second line of the display. Software version is: Version 2.2. Below some pictures of the VFO.